The visitors got off to the worst possible start in the first minute, making an early mistake and Morley went over in the corner after a slick counter-attack to lead 7-0. A deep kick from the home side then resulted in a line-out on Scarborough’s five-metre, Morley winning the line-out and crashing over with four minutes played, making it 12-0. 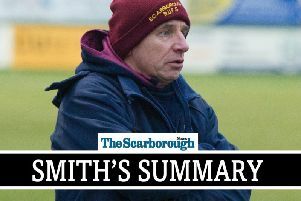 Morley continued their dominance with more relentless attacking play to breach the Scarborough defence after multiple carries and they went crashing over for another score to lead 19-0 after only 12 minutes. The hosts made it 26-0 four minutes later when more slick hands from the Morley back line put them over in the corner. Scarborough finally got on the scoreboard after 30 minutes, the visitors winning a scrum Tom Ratcliffe firing a ball wide for Matty Young to fly over in the corner, the conversion was missed, and shortly after the hosts kicked a penalty to make it 29-5. The visitors scored a second try before half-time to give themselves hope of a comeback, as the scrum collapses Jordy Wakeham quick tapped and Jimmy Perrett galloped over to make it 29-10. After half-time, Perrett scored his second try of the game to bring Scarborough back into the game, the conversion making it 29-17. Robinson was then sent off for the visitors, and Morley made the extra man play to pull into a 36-17 lead with another try. Scarborough refused to give in and scored another try through Luke Brown to make it 36-24, but Morley added another penalty a couple of minutes later to move 39-24 up. Ben Martin went over for another try for the 14-man visitors, the conversion making it 39-31 but Scarborough could not add any further points and the West Yorkshire side held on for the win.